TESL Ontario will be celebrating National Volunteer Week April 7 - 13, 2019 to pay tribute to the many volunteers who are an essential part of the success of this organization and its Affiliate Chapters. We consider our volunteers to be our most valued community resource. Sharing their time, expertise, commitment and vision, our volunteers inspire TESL Ontario to continuously find new ways to serve and support our members. We rely on the innovative contributions of our many dedicated volunteers to facilitate significant progress for English language educators in Ontario. We sincerely appreciate the dedication, time and skills of our volunteers. Please join us in sending a huge THANK YOU to all of the volunteers who make it possible for TESL Ontario to continue serving you. Tell us about the highlight of your volunteer experience with TESL Ontario and/or TESL Ontario Affiliate Chapter in the past year and you will be entered into a draw to win one of five $20 Chapters Gift Cards. Click here to view our Volunteer Information Brochure. If you are interested in volunteering with your local affiliate chapter, please contact the Affiliate Chapter representative for your region directly to express your interest. A complete contact list of Affiliate Chapter representatives can be found here. 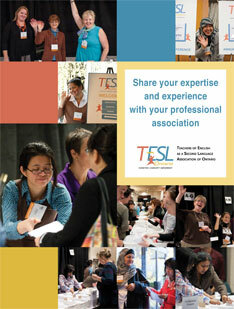 TESL Ontario has 5 working committees. Members are asked to fill out an expression of interest form and send it to TESL Ontario for consideration. If there are any committees with current openings you will be contacted. Click here to access the Expression of Interest form and instructions. "Everyone is so passionate about TESL professional development and we together deliver great conferences to our local membership." "As a retiree, I get great satisfaction from feeling valued for the effort I make on behalf of TESL Ontario and its members." "Volunteering has provided enormous opportunities to connect with colleagues, meet new people and even learn new skills. It's been an enlightening and rewarding experience."